Yesterday I really didn't do much. 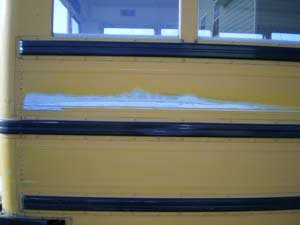 I scraped the front and rear upper window that used to say "School Bus". I am not really sure what I am going to do with these windows. I am working on some ideas. One cool feature about these windows is the fact that they are lighted. More paint prepping and body work was done today. I think I am starting to get too picky. Every flaw on the body now needs to be fixed. I figure if we are going to paint this thing the body should be in good condition. 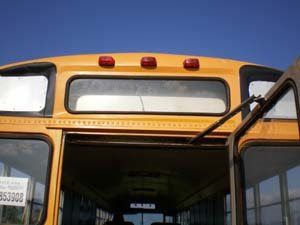 I started on the drivers side by removing all the Emergency Exit stickers on the outside. After removing all the stickers I went back over the whole passengers side and sanded it lightly. In some areas there was paint chipping so I made sure to sand it smooth in those spots so that no lines would be visible. I used 3 different grits of sand paper today. 60, 100 and 150. 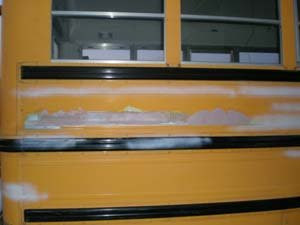 If I wanted to remove paint fast or get any built up sticker gunk off the bus then I used the 60 grit. The 100 and 150 I used to smooth things out. These are good grits to use on the Bondo. 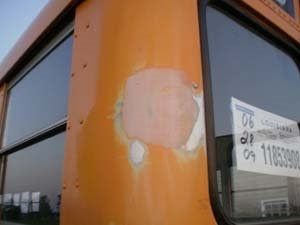 Once, the Bondo dried to fast before I could get it smooth so I used the 60 grit to smooth it down fast after it dried. 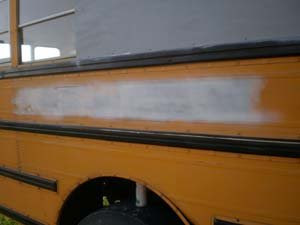 There was one area that had a lot of paint missing where a large decal used to be. I sanded it well, wiped it down with paint thinner and primed it. 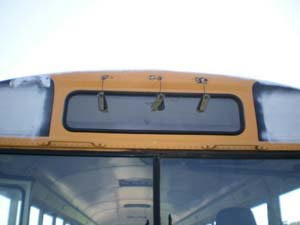 There is a body panel that has been bothering me from the moment we picked up the bus. 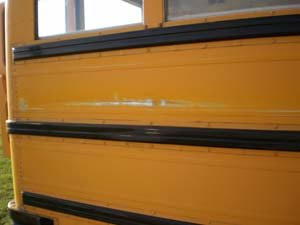 It looks like the driver of the bus must have ran into something and dented it pretty bad. 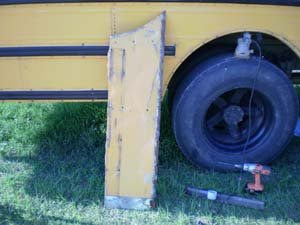 I went to pick up more rivets from my sheet metal friend and spoke with him about the panel. He can make me a new one! So I drilled out all the rivets, and with some serious prying and hammering it came out. 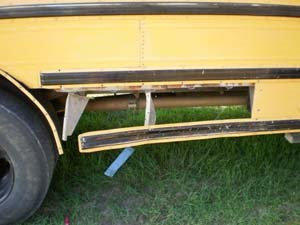 Here is a pic of the removed panel. Luckily this panel was small and required no cutting. I will take this up to the sheet metal shop tomorrow and he can use it as a pattern for my new piece. 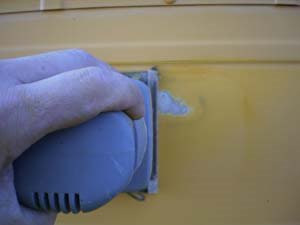 When you are up close to the body while sanding, it is easy to notice all the defects. 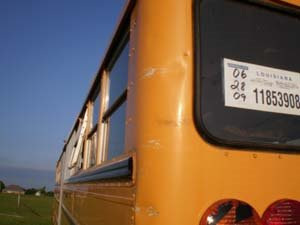 I noticed a deep scratch that ran along the back. First, I sanded all the paint away. 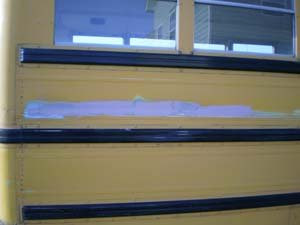 Here is the first coat of Bondo. After the first coat dried I sanded it and applied another. Tomorrow I should be able to apply a few more coats of Bondo and it will be done and ready for paint. 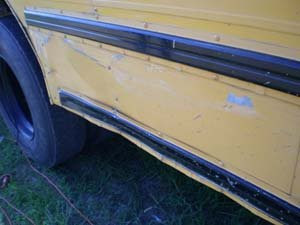 On the rear drivers side there where two good sized dents. 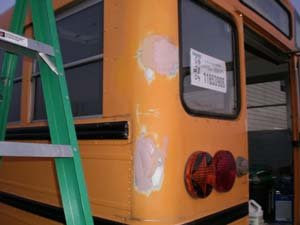 I sanded away all the paint and applied a coat of Bondo to both dents. A few more coats and some sanding will make this ready for paint.